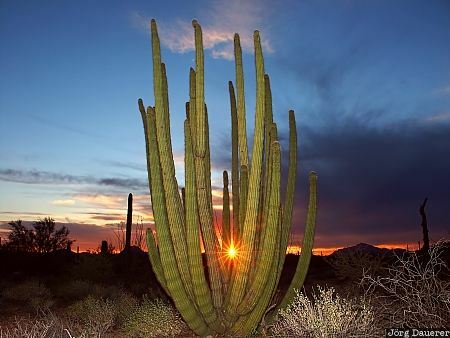 The sun is setting behind an organ pipe cactus in Organ Pipe Cactus National Monument in southern Arizona, United States. The cactus is partially illuminated by a flash gun (used as a fill flash). This photo was taken in the evening of a sunny day in February of 2004. This photo was the image of the month in April of 2013. This photo was taken with a digital camera.